Excited anticipation, with a little hesitance as well – that’s how I met with Mockingjay the morning I got up early and went to Walmart, forcing the lady stocking the books to open up a box so I could get a copy. She didn’t even know what Mockingjay was. Sigh. Sometimes I realize just how insular the book world is, and how little people outside of our world know about it. The verdict? I loved every minute of Mockingjay. So much so that I read it twice. People complain that the beginning is slow, but I couldn’t disagree more. It was perfectly paced, while the end was actually a little too fast! There was very little talk of the love triangle (thank goodness after Catching Fire!) and the book focused more on Katniss’ journey, which I found fascinating. The beginning laid out a very strong emotional ride that I loved. While I never got teared up the way I do in the one section of The Hunger Games, there was instead one moment that had me laughing out loud for a good ten minutes. There was a wonderful balance of light and dark, and the ending was just perfect. I’m not flailing now, as my muscles are rigid with the tension of holding myself together. The pain over my heart returns, and from it I imagine tiny fissures spreading out into my body. Through my torso, down my arms and legs, over my face, leaving it crisscrossed with cracks. One good jolt … and I could shatter into strange, razor-sharp shards. Mockingjay exceeded my expectations in every way and completely made up for Catching Fire. Katniss was back to her normal, wonderful, not-stupid self!! Now I want to go back and reread the whole trilogy. There’s, of course, new information given in this book, and I want to see those old books in light of the new. A few last notes: First, why do people take such issue with the naming system in Panem? I’ve heard people say Collins “makes up” ridiculous names, but at least half of them are old Latin names that she didn’t make up at all! Cressida, Messalla, Plutarch, Castor, Pollux, Octavia, Flavius, Venia, so on and so on. I don’t see what the big fuss is! Second, I really, really want a map of the Districts! We get more information about some of them in this book, and I’m dying to see what North American looks like under this new layout! DO NOT READ PAST THIS IF YOU HAVEN’T READ MOCKINGJAY. Unless you don’t care about spoilers. Also: This will be long. You have been warned. This is literally the longest review I’ve ever written. The third book in this series has Katniss wandering around the underground world of District 13. Her home in 12 has been destroyed, with few survivors. District 13 runs on precise schedules and rules, and they all want Katniss to be the Mockingjay, a figurehead and mascot for the Rebels in this war. Katniss herself is confused, disoriented, grieving, and in pain. She’s in no shape to become a mascot, but she has little choice if she wants to save the people she loves. There were so many good things to talk about in this book! First and foremost, I love the message on war: War is never one-sided. It’s messy, it takes sacrifices, and sometimes both sides will cross over an invisible line between fighting for justice and just plain inhumanity. Like Barty Crouch in the first war against Voldemort, sometimes the “good” side will fight according the same dirty rule book as the “bad” side. Gale with his bombs and his avalanche, playing by Snow’s rules in a fight to make a world better than Snow’s. How can you make a world better if you lose your humanity by using the same dirty tricks? It’s like what Peeta said before the first Hunger Games – the most important thing is not to lose your SELF in this war. People really became divided here, those who wanted to win with the least amount of violence possible, and those who didn’t care who they destroyed in their quest to win. War divides. There are people who can see that no one is purely good or evil, and those who are blinded by their politics. The conversation Katniss and Gale have about her prep team is a great example of this, because are the prep team really to be hated? They may be wrong in doing what they do, but you can’t blame them either. This is their world. This is what they’ve been taught. They genuinely care for Katniss, even as they prepare her for slaughter. Good or evil? War is so messy, and I love that Mockingjay didn’t end in some glorious battle scene. I love that everything fell apart, until you don’t know who’s on which side. Good, bad, right, wrong, it all gets jumbled up. Is Coin any better than Snow? Will Paylor be? There is no glorious climax in war, and I love that in the end, there was no real resolution. The Rebels won, oh yes, but to what purpose? By the end, it all just seems pointless in the amount of life that is lost. It didn’t slip by me, the irony of Prim’s death, seconds from the war’s end. Prim, who would have died had she gone to the Hunger Games in Book 1. Prim, for whose life Katniss tried to give her own, sparking the revolution that, in the end, could not save her. Prim, who after everything, died anyway, with Katniss powerless to save her. It was a masterstroke on Collins’ part. The resolution of this novel is so anticlimactic, which in some twisted, grim way felt perfect to me. Exactly as it should be. Unexpected realism, and a good message brought with it. Still, even after reading the book twice, I do have some unanswered questions. There were conversations throughout the book that never led anywhere, like foreshadowing gone wrong. Boggs’ last words to Katniss are never fully explained. And why, why, did Katniss vote YES to the new Hunger Games? Was it because she knew she was going to assassinate Coin, and thus the new Games would never happen anyway? Did she say YES only to get Coin to let her guard down? Or was it because she knew it was a choice between a handful of innocent children dying and the whole population of the Capitol? You never find out if that last Games took place, and I want to know. I want to understand Katniss’ motivation, because in every other respect, I understand her so well. That’s one of the reasons I loved this series so much. I love Katniss. So many readers were irritated with her, particularly when it came to the love triangle, but I understood her so well, and her character was so well developed for the first and third books (not so much in CF). Think about who she really is: Katniss, oldest of two, growing up in a horrible place, loses her father and mother at 11 years old. Suddenly, she’s in charge of providing for her family. She has to take care of them and keep them from starvation or worse. She never has a chance to process her grief for either parent, and the only way she survives is to bottle up those emotions and focus on the only thing that in that moment matters: survival. Katniss is a girl who knows only one thing, and when anything takes her out of that comfort zone, she is lost. She knows how to read people, but not their emotions. Anything involving emotions throws her off-balance. Survival becomes more difficult with time because it’s less about food and protection, and more about emotional assault. Katniss deteriorates, becoming less and less able to handle the horrors around her. Death haunts her, and she hates the monsters people around her become in this war. She never wanted to be a leader or a fighter. She doesn’t even want to be seen. She only wants to be left alone to protect the ones she loves, and yet she’s become this crucial piece to a war game that she wants nothing to do with. And people sneer at her when she’s unable to do it well. The unexpected, when it came to Katniss, was her singing. It was like she’d been pushed so far that the child part of her reemerged. All those years later, horror after horror, and suddenly she can do no more. So she sings. It’s a soft spot in her that proves she’s not only human, but has a heart. She is processing beyond childhood, finally growing up now that there’s no one left to protect. 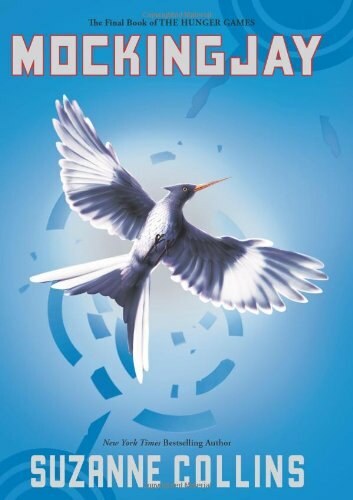 I was Team Katniss, but I still enjoyed the way this book ended. Gale turned out to be everything I predicted for him. He was bloodthirsty, cruel, indifferent with innocent lives, and loved the revolution far more than he ever cared for Katniss. He proved, over and over, that he didn’t understand her at all, nor could they live together without fighting. Peeta, on the other hand, proved himself to be strong and resilient. The hijacking they did to him was horrible, but even through it, he’s still fighting for Katniss, still warning her of dangers to come, still trying to hold back those nightmares even as the impulses Snow put in him say to kill her. I felt so sorry for him, but admired him all the same, and the hijacking eventually helped Katniss to really appreciate how wonderful Peeta genuinely was. It gave her a way to pay back her debts to him, helping him to sort what was real and not real. To put it all in Harry Potter terms (because that’s just fun to do), Gale is a Gryffindor: headstrong, brave, willing to jump into battle, restless, hasty, reckless, arrogant, and sometimes foolish. Peeta is a Hufflepuff: loyal, hard-working, and not necessarily too noticeable on his own. I guess there’s a reason I prefer Peeta. I married a Hufflepuff. They make great husbands. What I need to survive is not Gale’s fire, kindled with rage and hatred. I have plenty of fire myself. What I need is the dandelion in the spring. The bright yellow that means rebirth instead of destruction. The promise that life can go on, no matter how bad our losses. That it can be good again. And only Peeta can give me that. That is why I’m okay with them ending up together. Because finally, Katniss can see exactly what many of the rest of us could see all through these books. It’s not because Peeta is a better person (though I would argue that he is). It’s because he’s better for her. People complain about the epilogue, but I liked it. I love hearing how it takes Katniss many years, but she eventually decides she wants to have a family with Peeta. Katniss never wanted children, but that was only because she didn’t want them up for Reaping. There is no more Reaping. The epilogue says there are no more Hunger Games. For Katniss, the most important thing in the world is family and the people she loves and wants to protect. I don’t see her decision to have children when she is 30+ years old as contrary to her 16-year-old self. I see it as her facing her fears to do something that may scare her, but will also make her (and Peeta) happy. The anonymity of the children was also important, and goes back to Katniss’ wants in life. She never had the chance to stay quiet and hidden from the world. In not telling us her children’s names, she gives them that chance. It was perfect. Last notes, written to two of my favorite characters, and then I will end this super-long review. First, to Cinna. Oh Cinna, how I loved you, how I wished you’d come back! Alas, you didn’t, but at least you lived on in the things you designed and provided for Katniss. I was glad to at least see your presence all throughout the book. Second, to Finnick. I didn’t really know you well in Catching Fire, and didn’t know how to judge you, but in this book, I fell completely in love. I know that happens often, what with discovering how many people were paying for your body after you won the Games (at only 14 years old! How tragic! ), but what I loved was your self-deprecating humor. The stunt with the hospital robe cracked me up, so that I was laughing for a good ten minutes both times I read the book. I nearly cried when you died. No other death in Mockingjay affected me so much. I was glad to hear that you and Annie had a child, even if you never met him. You are the primary reason I want to reread the series, so I can see you in a new light in Catching Fire. That’s all. I’m going to assume probably no one is still reading by this point, but I just had so much to say! Sorry to go on so long. This entry was posted in 2010, Prose, Young Adult and tagged favorite, memorable, multi-read, shredded me, speculative. Bookmark the permalink.